The Children’s Literature Council of Southern California held their annual Spring Workshop yesterday at the Glendale Public Library (that's their nifty picture book area). Called “I Can Read It by Myself…But Do I Want To? Inspiring Emergent Readers,” it featured Megan Lambert as keynote speaker. Megan is Instructor of Children’s Literature Programs at the Eric Carle Museum of Picture Book Art, and as such she has helped develop the Whole Book Approach, a “critical framework and pedagogical method aimed at evaluating and using the picture book as an art form.” For more information on this method, please see the Museum’s short but informative explanation. The CLC of SC is composed of librarians, teachers, authors and illustrators, parents, and in fact anyone who has a passion for children’s literature. However, I’d say most audience members at yesterday’s workshop were librarians, and the program focused on how Megan uses the Whole Book Approach during storytimes at the Museum and in classrooms. This approach does not involve the usual storytime approach of reading a picture all the way through. It doesn’t even mean stopping throughout the story to talk about the illustrations and text with the kids. No, it’s much more radical than that – imagine taking one hour to go through Bill Martin’s Brown Bear, Brown Bear with a group of 5-year-olds! In a nutshell, the Whole Book Approach draws inspiration from Dialogic Reading methods, the Reggio Emilia philosophy, and Visual Thinking Strategies. The adult sharing the picture book acts as a guide to the book, but allows the children to make their own observations, find their own meaning, draw their own conclusions. It’s a learner-centered method that is also a great way for kids to have a shared literature experience. 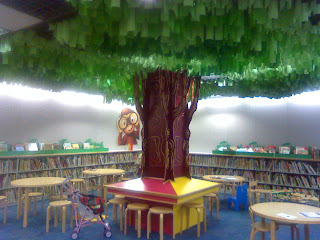 Facilitators draw children’s attention to certain aspects of the picture book, such as the jacket, gutter, endpapers, and so on, paraphrase children’s responses in order to sneak in some good art and literature terms, and point to parts of the illustrations that children are commenting on, but essentially the discussion is child-initiated and child-directed. In order to encourage kids to really take the time to observe closely and make responses, Megan says that slowing down is essential. The reason it can take an hour to get through a “reading” of Brown Bear, Brown Bear is that she can take 5 to 10 minutes on a page, talking about the illustrations, design elements, and how the pictures work with the text. Megan gave us many examples of insights about books that she gained from kids, who come to the books with fresh and curious eyes. I think most of us in the audience were fascinated and intrigue d by this method, but when we broke out into smaller groups to practice this method for ourselves, we ran into problems (that's a fuzzy photo of my group, with Megan in the center with bangs, trying to figure it all out). First of all, it quickly became clear that a lengthy perusal of a book is essential in order to figure out how to “make meaning out of the artistic and design choices present in each element.” Also, not every picture book lends itself to this method. We felt that we would need a LOT more training in order to present the Whole Book Approach and really make it work. 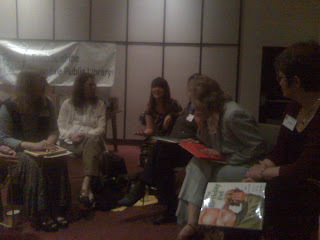 We librarians in the group also wondered how the method would work in a public library storytime setting. None of us could imagine spending an entire storytime on one or two books, although I think this might be really exciting to try with a class. Teachers and even picture book authors in our group commented that they’ve used variations of this technique many times, which bolsters my feeling that this method is sort of “teachy,” to use the technical term. This does seem to be a great way to get kids thinking and learning about picture books and in particular the art of picture books. However, I’m not convinced of the automatic link between the Whole Book Approach and the title of this workshop, the subtitle of which was “Inspiring Emergent Readers.” Yes, visual and even kinesthetic learners would get a lot out of approaching picture books this way – and it might give everyone a new appreciation and way of looking at picture books. But does it actually inspire readers? Megan commented that sometimes kids, especially girls who are good at sitting still, will sigh in exasperation and say “Can’t you just READ the book?” Megan says she responds to this by saying, “We are reading the book. We’re reading the pictures.” Fair enough, but I think there are a lot of kids who, although they might enjoy delving into the meaning and complexities of the illustrations, would be likelier to gain a love of stories by hearing them all the way through, by being transported by the story. As a German Literature major, I took numerous lit courses in college. Although often I enjoyed dissecting the books we were studying, my keenest pleasure came from just plunging into the story and reading it without having to dwell on this or that element. It’s important to be able to examine and discuss a book – for students of any age – but perhaps simple pleasure in a story ought to come first. The Whole Book Approach is obviously useful and valuable – Megan’s many anecdotes and experiences all point to this – and I would love to see it demonstrated with a group of kids so that I can understand better how it works. I would also love a longer, more hands-on workshop so that I gain some experience and comfort with the method. However, judging from the conversations I had with fellow participants after the workshop, our wheels are all turning and we will be looking at ways we can use elements of the Whole Book Approach to enhance kids’ love of literature and reading. And that’s the whole point. I'll play devil's advocate and report that few children at Preschool Story Time are "transported by the story." Books encouraging movement and noise making are usually more successful than books with great stories. I'd argue pictures play the most power role in peaking young children's interest in a book. So it makes a lot of sense to spend time with the illustrations. I'd love to see Ms. Lambert conduct a Whole Book Approach Story Time with children. That's a good point - kids do love the illustrations. I think watching an entire Whole Book Approach Story Time with kids would really help me understand how it works and how the kids react. Its really very good article... I enjoyed to read this post. I like your way of expressing articles through excellent words.Your way of expressing things is best and informative.Keep sharing articles like this. Oooh - I want this as a poster! Day 4 - A Visit to the Library! Share a Story - Shape a Future begins today! Favorite Library contest - win a book! But where's the science fiction? Norton shortlist - I've actually read them all! !